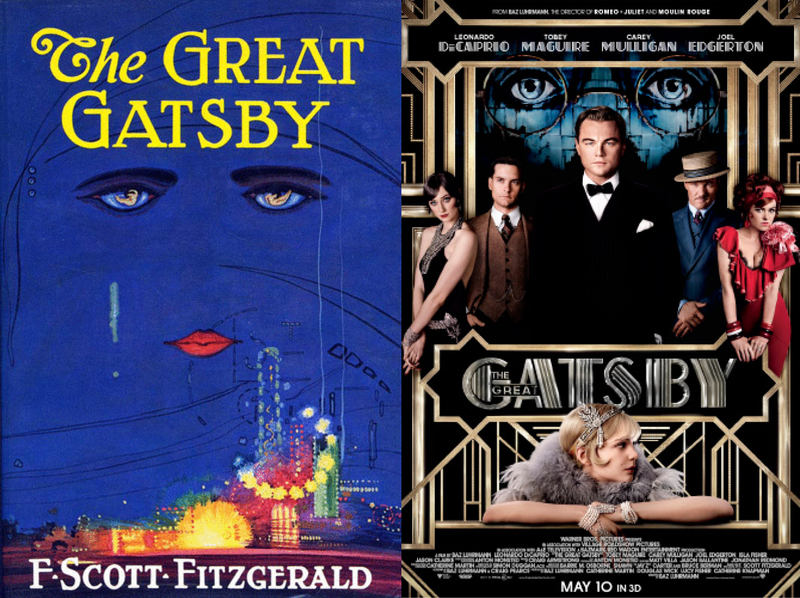 The star of this fanciful and mostly faithful adaptation of The Great Gatsby is the book itself. When we first see the battered billboard of Dr. T.J. Eckleburg standing watch among the ash-heaps—a pair of glasses framing unblinking eyes, a familiar blue-cast background, and the carnival lights of the city below—it evokes the now iconic cover of the 1925 novel. This is by design. Publisher Charles Scribner’s Sons famously commissioned the jacket art—the floating, spectral image of Daisy Buchanan peering out from above the night sky of Coney Island—well before the manuscript was completed, and Fitzgerald liked it so much he wrote it into his novel. The Queens-based optometrist towers over the landscape and the story, just as the book towers over the film. 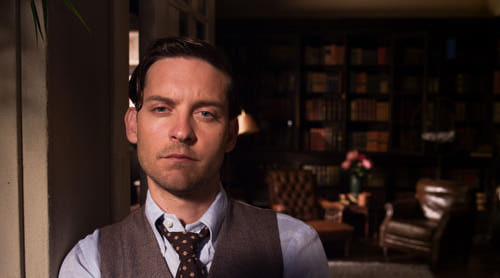 Nick Carraway (Tobey Maguire), our narrator, is not just an eager young bond trader, but a would-be novelist. When he arrives at the Buchanan’s East Egg home, the first thing his pompous old school chum Tom (Joel Edgerton) asks is “how’s that Great American novel coming along?” Condescending, and, as it turns out, premature. Nick would write that novel (or memoir, really, if we’re to believe everything he writes is true—and we must!) as a way to make sense of the events that would occur over that fateful summer of 1922. He becomes a stand-in for Fitzgerald, calling his book “Gatsby” before hastily scribbling in the necessary qualifier. But Luhrmann expands on this notion, bookending his movie with new scenes of Nick as a patient in a well-appointed sanatorium. We never learn why he’s there, exactly. Alcoholism, perhaps, though that’s not supported in the novel. Despite the many references to booze, Nick maintains that he’s “been drunk just twice in my life.” More likely it’s a mental breakdown. This is entirely plausible—we know by the end of the book that Nick is “haunted” by Gatsby’s death and is burdened by being the only one who knows or cares about what really happened. His doctor suggests writing it all down as a form of therapy: “A memory, a thought, write it down,” he says. As Nick feverously begins to type, the words of Carraway-as-Fitzgerald literally fly off the page as letters swirl and soar about the screen (and off it if you’re seeing it in 3D). Maguire’s narration fuels the film from beginning to end. He smiled understandingly—much more than understandingly. It was one of those rare smiles with a quality of eternal reassurance in it, that you may come across four or five times in life. It faced—or seemed to face—the whole external world for an instant, and then concentrated on you with an irresistible prejudice in your favor. It understood you just as you wanted to be understood, believed in you as you would like to believe in yourself, and assured you that it had precisely the impression of you that, at your best, you hoped to convey. Precisely at that point it vanished—and I was looking at an elegant young roughneck, a year or two over thirty, whose elaborate formality of speech just missed being absurd. You need that big overdone moment, the obscene money shot, to establish both Nick’s and the viewers’ point of view of the sheer absurdity of it all. DiCaprio is perfect as Gatsby, with a composed swagger and a just-below-the-surface intensity. You believe him as both the richest man on Long Island and the insecure kid from scrappy beginnings. Maguire’s patented wide-eyed earnestness works well in early scenes, but he’s not as convincing as the shrewd chronicler of events later on. Edgerton’s blustering portrayal of Tom is riveting. He has a hulking, bullish presence that makes him seem older than Gatsby, even though the actors are rightly the same age. This feels right: new money trying to usurp the established order. Newcomer Elizabeth Debicki is everything you imagine Jordan Baker to be in the book: cool and captivating. Carey Mulligan has the impossible task of embodying one of the best known but least understood heroines (anti-heroine?) of twentieth century literature: Daisy Buchanan. She’s perfectly lovely, but too much of a wispy dreamer to be Fitzgerald’s “golden girl” with the voice “full of money.” You just want to give her a hug and tell her it’s going to be okay. Daisy was always more of an ideal in Gatsby’s head than a fully realized character, but you still can’t help but wish Luhrmann had cast a complete unknown, someone who would forever define the part, his own Vivian Leigh. Books don’t usually have soundtracks attached to them, but The Great Gatsby comes close. Fitzgerald wrote the quintessential Jazz-Age novel and the music of the 1920s practically shimmys off the page. Still, Luhrmann turned to hip-hop artist (and executive producer) Jay-Z to provide a modern soundtrack. There’s a definite Jazz flavor to it, and it works as part of the film’s over-the-top grandeur, but it would have been fun—and even more daring—to stick with all period Jazz and make it relevant to a whole new audience. The 3D works as more than just a gimmick, immersing us in the spectacle and decadence of this world. And when we first catch sight of that big yellow car barreling down the road, we know we’re in for an unforgettable ride. It’s right after the kiss that Daisy tells Gatsby they should run away together. Gatsby refuses, and is almost offended by the idea. His plan all along was that they would live together at his mansion. She never says this in the novel. We know what Gatsby wants, but Daisy’s intentions are much less clear. When the group has lunch at Tom and Daisy’s house, Gatsby anxiously paces the room and steals looks with Daisy, seemingly pushing hard for her to tell Tom of their affair and to reveal that she doesn’t love him. In the novel, his actions are much less overt. In their suite at the Plaza Hotel, Tom provokes Gatsby by insinuating the illegal nature of his business to Daisy. Gatsby lunges at him, shouting “Shut up! Shut up! Shut up!” and the two physically go head-to-head, locking horns like bulls. In the novel, Gatsby’s reaction is much more contained, but no less explosive. Nick remarks only that he was “startled at his expression,” and describes it as looking “as if he had ‘killed a man’” It’s easy to understand why the film chose to go the more theatrical route. Besides getting some play in the movie’s trailer, this is a key scene where we see the final break in Daisy’s resolve. There’s no going back for them from this point, regardless of the tragic events that are to follow. We are privy to what Tom tells Wilson in the garage after the accident. In the novel, we can guess that he utters Gatsby’s name, but we don’t learn the truth until Nick confronts him at the very end. Nick talks with Gatsby one last time at the mansion, as a deluded Gatsby assures himself that he “must always being going up.” He then throws a stone into the pool, which quickly sinks to the bottom. In a novel dripping with symbolism and foreshadowing, Luhrmann couldn’t help adding a bit of his own.